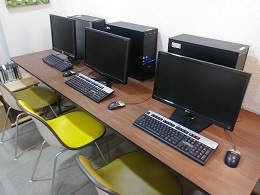 There are 5 Computers Available for public use. One-On-One Computer tutoring is available, please call the library at 303-823-5165 or email info@lyonsregionallibrary.com to make an appointment. Each Computer has access to a printer. Black & White printouts are 10 cents per page. Free Wi-Fi is available throughout the building. No log-in is necessary.